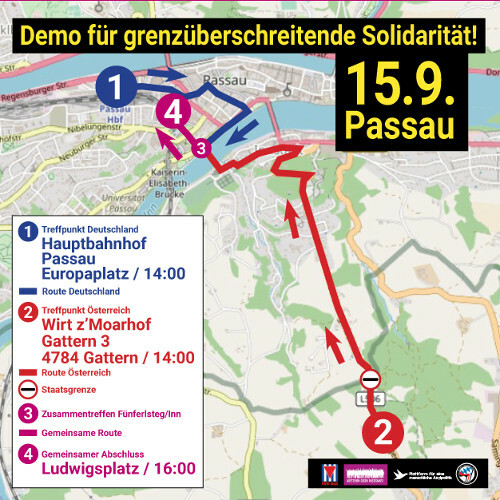 Passau: Protest for solidarity across borders! On the 15th of September 2018, activists gather at both sides of the border between Austria and Germany. The protest marches will meet in Passau. During a joint closing rally, the walls of „Fortress Europe“ will be symbolically breaked down. A collective arrival by bus will be organized. If interested, please contact passau.grenzenlos (at) gmail.com! We – activists from Germany and Austria – are outraged by our governments‘ plans to close borders and build more mass camps for people. It is their policy that is killing thousands of people in the Mediterranean. CSU, AfD, ÖVP and FPÖ are forging „axes“ across Europe to push their racist agenda forward. We set a sign of international solidarity and on 15 September symbolically break down the walls of the „Fortress Europe“ on the German-Austrian border near Passau. On to Passau! Let us stand together for our welcome culture and indivisible human rights. If you want to support the action, write via Facebook or passau.grenzenlos (at) gmail.com!